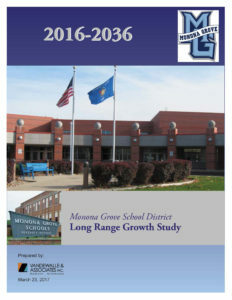 Monona Grove School District - Long Range Growth Study | Vandewalle & Associates, Inc. In 2017 Vandewalle & Associates conducted a long-range growth study for the Monona Grove School District to help the District plan for future facilities and accommodate a rapidly growing population. This study used a groundbreaking new methodology that combined both student grade progression (cohort survival) projections with new projections based on planned Residential Development. This dramatically increases the accuracy of the projections over the short term as it factors in the actual class size of enrollment today. The purpose of the study was to provide the Monona Grove School District with a framework from which to make informed decisions regarding the future of its educational facilities. The study included projections of student population growth within the District over a twenty year period through 2036 in five year increments, including the expected location of this growth. The study showed the district could grow as much as 13 percent in the next five years. This was an update to a previous study Vandewalle directed in 2014. Unique process. Using a comprehensive yet broadly applicable approach, information was synthesized from a vast range of sources, including District enrollment records, Census data, housing permit records, adopted land use plans, and official population projections. Meetings were also held with staff from every municipality that might influence the District’s long-term growth to gain a more well-rounded understanding of current conditions, trends, and planned developments throughout the District. From this, projections were made on a parcel-by-parcel basis for every grade level through 2036. Best practices and suggested courses of action based on these findings were also included.